I’m sure that some people will disagree with me, but I really feel that Nolita is lacking unpretentious, yuppie-free happy hour bars. Well, there is one exception: Botanica. This is a regular after work haunt for fellow knobbers of Nanz and me. We usually all pile in at our regular table – on the right, past the bar, across from the bathrooms. We even have assigned seats, it’s sick, I know. Botanica has a perfect location for any sort of meet up. It’s within five blocks of the B, D, F, V, N, R, and 6 trains. Liquor reps love this place, too. In the last two months, there have been reps for Dewars, Jack Daniels, and Stella/Budweiser, all giving away full-size samples of their wares. Also, as a former bartender, it’s important for me to have personable drink slingers at my spots. Mark, the owner, tends bar frequently. He remembers most of our names, and our usual drinks. He remembers our drinks so well, that we often won’t order something different, even if we want to. We wouldn’t want to make Mark feel bad. Mark’s wife, Jessica, also tends bar. She’s super nice and is always smiling. Dave has a heavy hand and he’s not bad to look at. 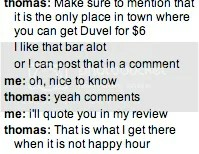 As for the atmosphere, it’s just your typical divey type bar. There are plenty of comfortable (and not so comfortable) seats. There are a couple of ratty couches and a back room with a stage of sorts (although I’ve never seen a band play). Most nights, there is a dj that plays good background music, usually indie rock…lots of MIA. There is really only one thing that I can complain about, and that is that sometimes Botanica smells bad. Granted, as I have already mentioned, my group always chooses to sit right next to the bathroom. So Milka M-Joy with Peanuts and Flakes was a candy bar I picked up at the Garden Gourmet up in the Bronx. While an obscure looking candy bar…. I found that it is a Kraft Foods product produced in Europe, and I think specifically Germany. The bar claims to be Alpine Milk Chocolate, but I am not quite sure what that is supposed to mean…a google search didn’t bring me any conclusive results. My first experience with the corn flake candy bar was with a Ritter Sport with Cornflakes that Leah had bought to share. The Ritter bar really surprised me, because I had never thought of putting the corn flakes into chocolate before and this is what made me purchase the M-Joy. Overall the chocolate was dense, rich, and creamy, and the bar itself was thicker and of a better quality than most of your typical American candy bars (think a slightly better version of Mr. Goodbar). So I like peanuts and the flakes, but together I felt that they just kind of canceled each other out. As you know a peanut has a very distinctive taste, and the corn flake is very subtle. I almost felt that the peanuts were too overpowering to be in the same bar with the flakes in respect to both taste and texture. The texture of the flake is very delicate where as with the peanut is big (for a candy bar) and crunchy. Don’t get me wrong…The Milka M-Joy was a tasty snack, but when it comes down to it the Ritter Sport Cornflakes bar I felt was just a better piece of candy. With the M-Joy the unique ingredient of the cornflake is just lost. Leah and I saw this movie on Tuesday, at an IFC center advance screening open to members only. This was my first time attending such an event, and it was surprisingly not very crowded. Perhaps because the movie started right at 6 pm? Anyway, Paranoid Park is the new film by Gus Van Sant. I really liked his last one (Last Days, starring Michael Pitt and about the days leading to the death of Kurt Cobain), but I think Elephant was pretty underwhelming. I guess Good Will Hunting is okay, and I actually just found out that he directed the film adaptation of Even Cowgirls Get the Blues, which is a Tom Robbins novel ( but not my favorite). I should probably watch that at some point. Paranoid Park is about a teenager in Portland who, while hanging around a pretty rough skatepark, gets involved with a murder investigation. The movie does a good job of putting the audience right inside the head of this boy through his writing of the story of Paranoid Park in his (a little too chic?) Moleskine notebook. 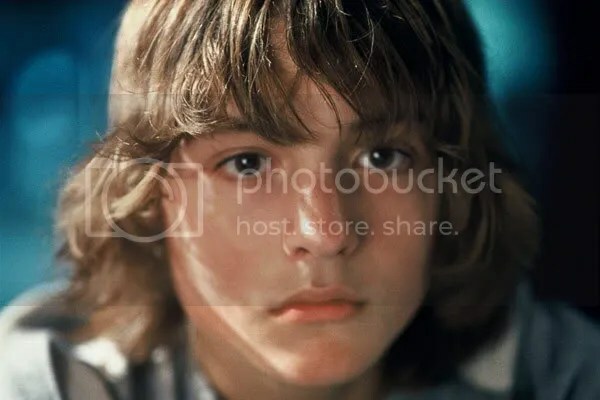 Not so surprisingly, being inside the young skater kid’s head isn’t the most dramatic place in the world, regardless of the events that unfold around him. The kid manages to keep his cool throughout most of the movie (with a couple of exceptions), and Van Sant conveys this feeling through slow and quiet shots of skaters doing their thing, or the main character walking through hallways, or taking a shower, or sitting on the beach, with kind of intense experiments in noise and static playing in the foreground. This is why I love ambient music! I really enjoyed how the music was in the foreground for these shots, and such a significant part of the film. Because of this, Paranoid Park definitely had an avant-garde feel to it, but not so much as to detract from the plot or the actors at all. Totally dreamy, right? Anyway, some girl from Gossip Girl was also in the film as his totally annoying, but kind of hilarious, girlfriend. Her ridiculousness caused comic relief, for sure. 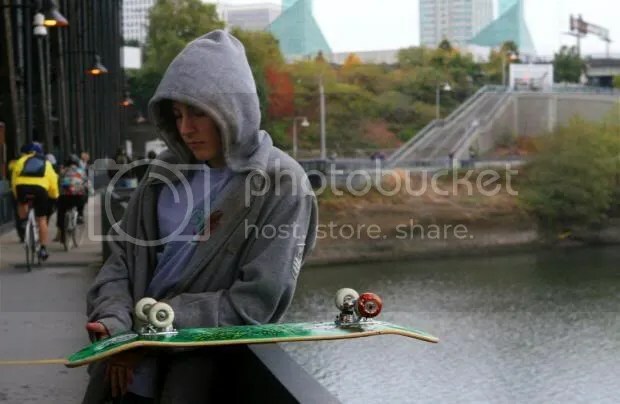 I also really liked that the movie was filmed in Portland; it provided a nice backdrop to the plot and the skateboarding. The laid-back, post-grunge atmosphere was appropriate for the overall tone of the movie. It made me want to go there again, for more than 24 hours! Maybe some kind of rating system would be a good addition to this review. I give Paranoid Park **** ½ (out of *****)! I really love this, and it is the first Tumble Log that Critical Reviews has chosen to follow. I present to you: Garfield Minus Garfield! The Magnetic Fields at Town Hall, Saturday February 23rd, 2008. This show was one of the best sit down experiences of my life, and I have Kate and Anoop to thank for it (thank you for buying tickets during the pre-sale, we all had killer seats!). Town Hall first of all is a really beautiful venue, and I am happy to go there no matter where I am sitting, but we happened to have tickets for Row B (the second row), and Stephen Merritt was so close to us that I felt like I could touch him (and if I tried I probably could have). The only other time I had been to Town Hall before was for Prairie Home Companion, and we sat in the balcony (there really isn’t a bad seat in the venue). As far as the Magnetic Fields go I had seen them once before in Raleigh, NC. When I saw them previously I was so tired from driving that I found myself falling asleep while they were playing (not because I was bored, just exhausted). This time I got the Magnetic Fields experience I had always wanted. The opening act was the Interstellar Radio Company. This was a group of people who did a reading of the Tell Tale Heart. It was actually pretty neat. One gentleman did all of the voices, another did some minimal backing music, and a third did sound effects. While the reader and musician were very good at what they did…the highlight by far was the gentleman who did the sound effects. He used everything from drum machines, to his throat (making the heart beat), and even celery (breaking of arms and legs). Their performance only lasted about 15 minutes, and was the perfect short opener for the Magnetic Fields. The Magnetic Fields played for just over an hour and a half. They took an intermission after 40 minutes, and then came back on stage to finish the set. Unlike the last time I saw them, they played as a five piece. They had their normal line up of: Stephin Merritt, Claudia Gonson, Sam Davol, and John Woo. But they were also joined by Shirley Simms. I was very confused at the show because I had only remembered the band as a four piece. Simms’ voice and presence fit in so well with the band, and after doing research this is because Simms has been collaborating with the Fields since 69 Love Songs (and sings about half of the songs on Distortion). I knew that her voice was familiar (she also sounds a lot like Claudia). One interesting thing was that Claudia sang some of the songs that Stephin usually sings. It was just wonderful being able to see the dynamic in the band where it is possible for them to switch on and off vocals on songs that are typically done by the other vocalist. Some song highlights for me were: “Papa was a Rodeo” (which Stephin kept telling the band to play faster…it was a very slow version of the song), “I Don’t Believe You” (from i), “California Girls” and “Zombie Boy” (from Distortion), “Take Ecstasy With Me” (from Holiday), and an impressive live version of “Three-Way” (which I was surprised to see played live at all). The set also included several sound track songs as well as a couple from the Gothic Archies albums (possibly a track by the Sixths as well). The banter between Claudia and Stephin was wonderful, and as always funny. The band was extremely tight. My only wish was that the show would have lasted much longer, but I know that was just a dream. If I could have afforded it I would have loved to go all four nights. St. Vincent and John Vanderslice covering the Magnetic Fields. There are no photos in this post because all photos of the show were copywrited. So we showed up to the Kati Roll Company at about 12:30 in the afternoon this past Saturday (I was with KLK, Anoop, and Kate), and we walked right up to the counter. There was no one in the restaurant which was kinda weird, but we quickly found out why. They apparently weren’t open yet? Yes, it was 12:30 and we were at a prime lunch spot, and they told us they were not opening for another half an hour. We walked down the street, and everyone but me got a falafel as an appetizer. Then we grabbed some coffee/tea. We headed back to the Kati Roll Company at about five minutes til 1pm, and there was already a line to the door, and some people had already been served. This was kinda lame, being that they told us to come back later. But we really wanted Kati Rolls (I have been craving them for a couple weeks), and luckily were able to get a seat in the tiny restaurant. 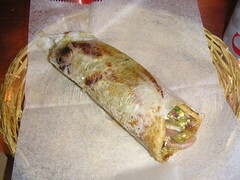 For those who don’t know what a Kati Roll (or Roti Roll) is…it is basically an Indian version of a burrito. The fillings vary from spicy potatos to cheese to veggies to meats, or any combination of them. The wrapping around the outside is most likely made of flour, and reminds me of a thinner version of naan. I ordered two rolls. One of the Aloo Masala (spicy potatos), and one of the Achari Paneer (Indian Cottage Cheese marinated in spicy pickle). I asked for both spicy! Both of my rolls were delicious, filling, and very spicy. It all depends on the spice for me, but these tasty bites left my mouth on fire for a while after I finished (and the fact that I was drinking coffee didn’t help too much). I can’t really say that liked either of my rolls particularly better than the other. They were a bit greasier than I would have liked, but still completely satisfying none the less, and I am still craving more. As far as selection: they have about 8 different rolls, 3 or four of them being vegetarian, but I feel that Bombay Frankie-Roti Roll (up near Columbia University) has more options for the non-meat eater (more veggie options including tofu and mushroom, peas, and cauliflower fillings). Also if I recall correctly Bombay Frankie was significantly less greasy. I enjoyed Kati Roll Company, and most likely will go back, but will probably make a stop at Bombay Frankie-Roti Roll (look for a review hopefully in the near future) before my next visit to the Kati Roll (so I can more accurately compare). 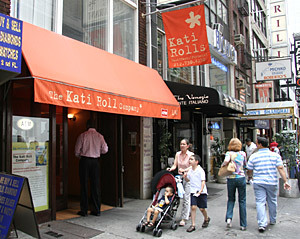 I have also read of a Kati Roll street vendor in Mid-Town that I plan on trying to locate. Am I at a frat party? 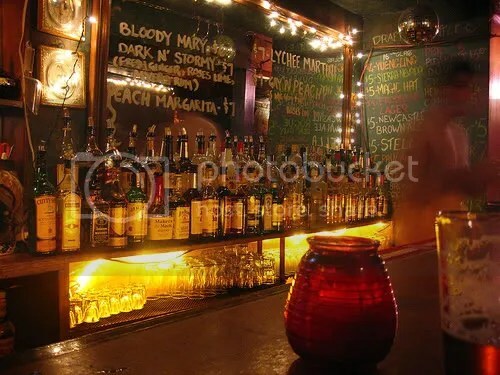 A hipster dive bar? Happy hour in the financial district? On the Lower East Side with all the bridge and tunnel folk? What place could draw all of these people? 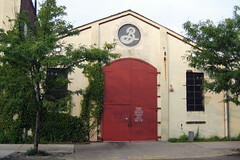 The local brewery can, and Brooklyn Brewery does…one of the few places that can make any person feel at home. So the brewery is open 5 or 6pm-11pm on Friday for happy hour, and I went this past weekend (also open Saturday afternoons for brewery tours and beers). I have been on Saturdays several times, but never on a Friday. The brewery is pretty wonderful. When you walk there are brewing vessels directly ahead of you and a larger room to the right with lots more brewing equipment (this is where the tour takes place on Saturdays). To your left you find a little gift shop, and a large room with tables, a bottling line for the Brooklyn Local 1 (this is the only beer actually bottled at the brewery in Brooklyn. The rest are done in Utica, NY), and a bar with eight delicious taps! The little gift shop is where you buy tokens, each good for one 12oz draft beer (these tokens are $4 each or six for $20). 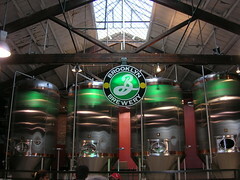 They also sale bottles of the Brooklyn Local 1 for $10 (25oz). In my opinion six good beers for $20 is a great deal, and I don’t think I have been as drunk as I was on Friday in a longtime. Leah got to the brewery first, probably a little before 6pm, and was luckily able to grab the last table with no one sitting at. I arrived shortly after her. We both got beers, and held down the fort at our table. We got asked if we were saving seats, and even got some mean looks, but in the end our crew showed up and we had a table full of people. This can be a really fun place if you get there early enough to carve out a spot for yourself. I imagine that it isn’t as fun if you come in at 9 or 10pm and expect to find a table. 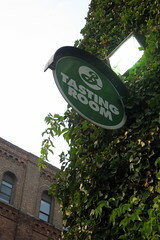 This is one place in NYC that it is ok to roll deep(bring lots of friends)…it’s more fun that way. Oh and if you get hungry they let you order food in! Or maybe a place to meet new people because if you don’t have enough people to fill the whole table you probably will end up making new friends. Beer wise they had the normal Brooklyn Lager, Pilsner, IPA, Brown, and Weisse…but also had the seasonal Winter Ale, and two of the Brewmaster’s Reserve: Bright Golding(not recommended) and the Extra Brune, style-wise it is a Flanders Oud Bruin. This is kinda a random style, and I was really happy to see it. Taste wise it is a variation on a Belgian Brown Ale. This particular one was a little bit sour (lactate yeast possibly), slightly sweet, very fruity, with a caramel backbone….extremely well rounded…everyone at my table seemed to enjoy it (Delicious! Way to go Garrett Oliver!). 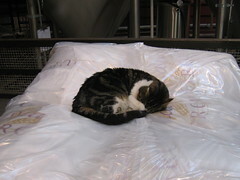 And now looking at Brooklyn’s website I realize that the Extra Brune is 8.5% ABV…thats why I got so drunk! Beer wise there is always something interesting, and I know I will be back soon because I still had a couple beer tokens in my pocket when I left.